On the GPU side we find the Adreno 430 powering the Snapdragon 810. Together with LPDDR4 running at up to 1555MHz, this should give plenty of performance to power the 1440p screen of the Nexus 6P. Please keep in mind the performance differences to other Snapdragon 810 as I’ll try to give an explanation to the delta towards the end of the section. 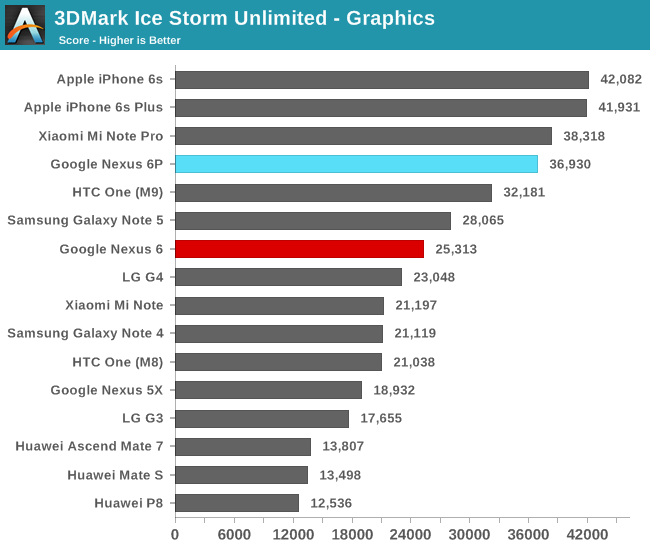 3DMark Ice Storm Unlimited is a 720p offscreen benchmark that stresses a lot of different aspects of a GPU. Here we see the Nexus 6P perform very well as it manages to almost reach the top of the line-up, only to be beaten by Apple’s A9 processor in the new iPhones. 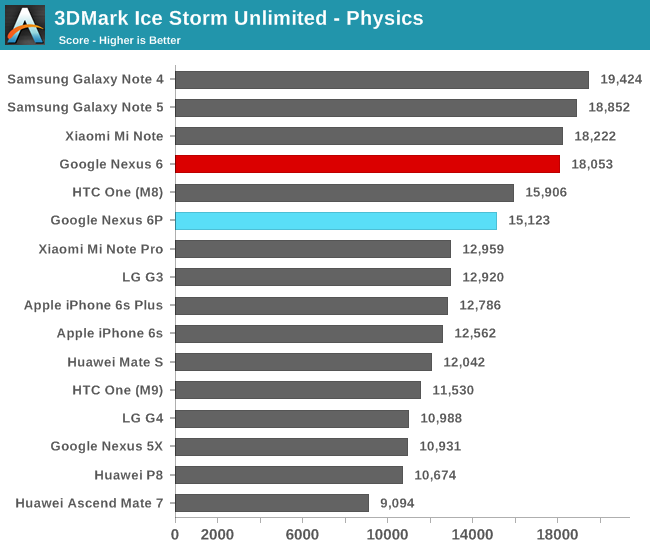 The physics benchmark is mostly a CPU benchmark while also stressing the GPU a bit – again we see the Nexus 6P perform well and most noticeably better than other Snapdragon 810 devices such as the Mi Note Pro. 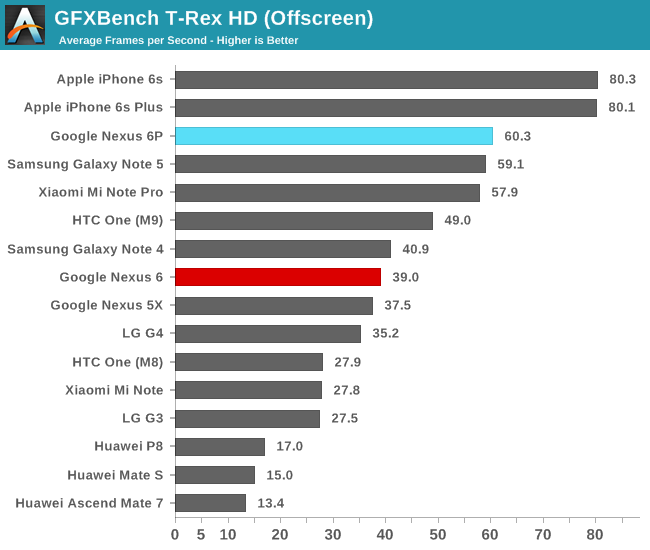 We next move on to GFXBench from Kishonti. The benchmark has been a staple of our benchmark suite for a couple of years now as it offers insight into different aspects of a GPU’s performance, such as texture and fill-rate bounds loads to ALU heavy tests. T-Rex is of the former nature where we see high emphasis the GPU’s texture and fill-rate capabilities. Here the Nexus 6P actually manages to perform the best among Android devices, slightly edging out the Mi Note Pro and the Note 5. Please keep in mind that our benchmark scores of the HTC One M9 are of a 2.0 revision of the chipset with slightly lower memory and GPU clocks. For the on-screen T-Rex test we see the impact of the 1440p resolution of the device. 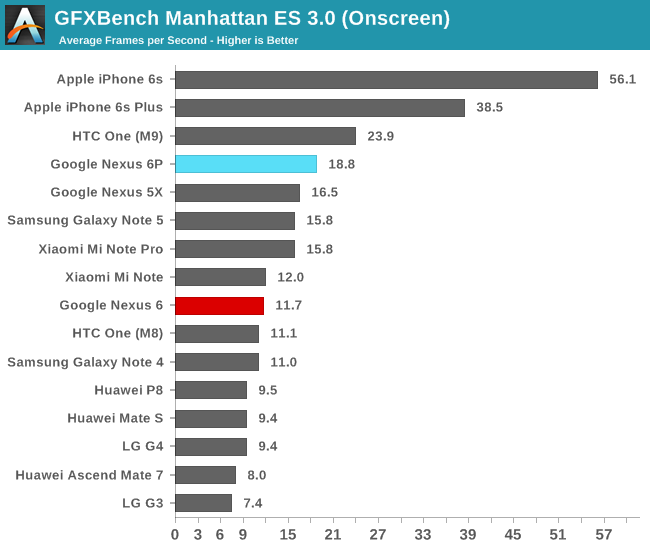 Scores are overall lower, but still manages to perform comparatively well to other devices, only being beat by the unique combination of 1080p and Snapdragon 810 of the HTC One M9, and of course the new iPhones who also themselves are hitting Vsync limits. Manhattan 3.0 is a more ALU heavy test with more shader effects and thus represents a different kind of load compared to the T-Rex test. 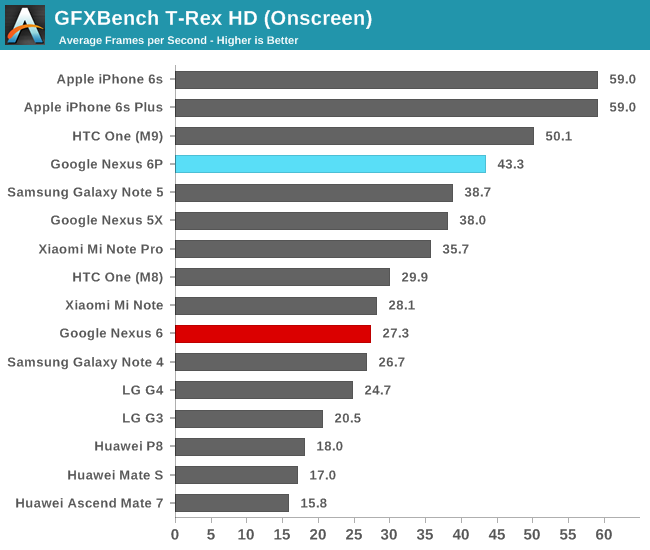 Again the Nexus 6P performs well in the off-screen test as we see it yet again jump ahead of the Android competition. The onscreen test paints a similar picture, the 1440p resolution of the device brings down the frames per seconds considerably. Nevertheless, we see competitive performance given that we’re talking about an 8-month old SoC towards the end of its lifetime. As mentioned earlier in the section, I pointed out that one should keep in mind the slight performance difference of the Nexus 6P compared to other Snapdragon 810 devices. 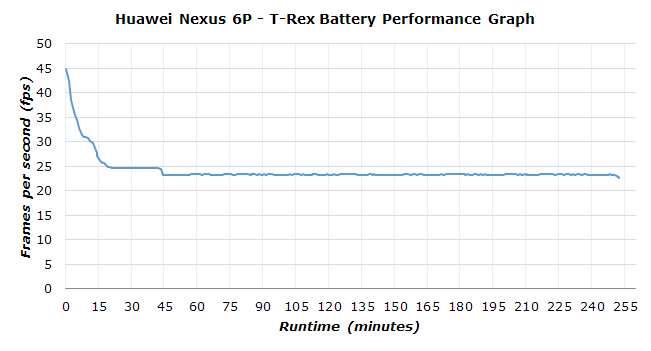 While normally one could argue this is possibly due to newer drivers or other slight software improvements, I believe it to be caused by better thermal dissipation performance on the part of the Nexus 6P. While looking at the battery performance graph we’re able to see the GPU throttling behavior of the 6P is ever so slightly better than that of the Mi Note Pro. The 6P manages to actually run 1-2 cycles of T-Rex before starting to throttle down in performance, whereas the Mi Note Pro would already throttle within the first run-cycle. That being said, the SoC will still throttle to about 50% of its peak performance leading to an overall sustained performance that one cannot be too enthusiastic about. It is unfortunate that the switch from 1080p to 1440p has managed to eliminate most of the performance and efficiency advancements of this generation as we see the Nexus 6P performing not much better than some 1080p Snapdragon 801 devices. While there’s been a lot of discussions about the Snapdragon 810 this year, this review isn’t the right place to dwell too much into details of that topic (I’ll shortly get back to it in the battery section). I did however notice one common characteristic between the devices sporting the SoC this year was that it seems that manufacturers were ill prepared for the higher thermals of the chipset. 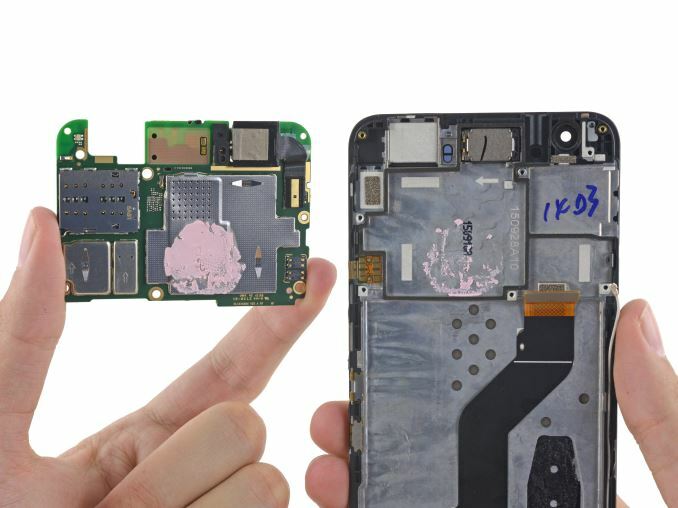 Image courtesy of iFixit Nexus 6P teardown. The Nexus 6P looks to be among one of the better designs fit for the chipset. As we see in iFixit’s teardown of the device, the SoC rests against the metal mid-frame of the Nexus 6P and even has thermal paste applied to it to allow for better thermal conductivity. This seems to allow for the whole display assembly to act as a heat sink, giving the 6P considerably more thermal headroom when compared to other devices. We already had a brief look at the thermal behavior of the Snapdragon 808 in our review of the Nexus 5X, but this was rather a comparison against devices previous generations of Snapdragon SoCs. While in the future for the Snapdragon 820 I’m planning a broader piece with more details and a historic look at Qualcomm’s SoCs, I wanted to already take advantage of this piece to highlight how a single SoC can have vastly different thermal behavior across a range of SoCs. As a thermal test I use the same power virus that we use for the testing of CPU power curves in past reviews and deep dives. This time around I limit the test to two threads, meaning only two cores are ever loaded during the testing. This assures us tat we get a more reasonable thermal load and also enables the Snapdragon 808 to be compared against the 810 and Exynos 7420. Since all SoCs and devices in the line-up sport the same ARM Cortex A57 we can use the amount of time at a given frequency as a metric of same amount of work done across all devices. For logging and presentation, I use the same methodology as explained in our CPU core-count investigation piece. As a reminder, the method uses logging of aggregate time-in-state metrics of the CPU’s frequencies instead of fixed sample period polling. This enables us to always be fully accurate in terms of the time that the CPU resides at the various frequencies. It also allows for creation of stacked graphs that are able to better visualize the gradual change in thermal throttling behavior. the throttling behaviour and thus may not represent a fully fair comparison. 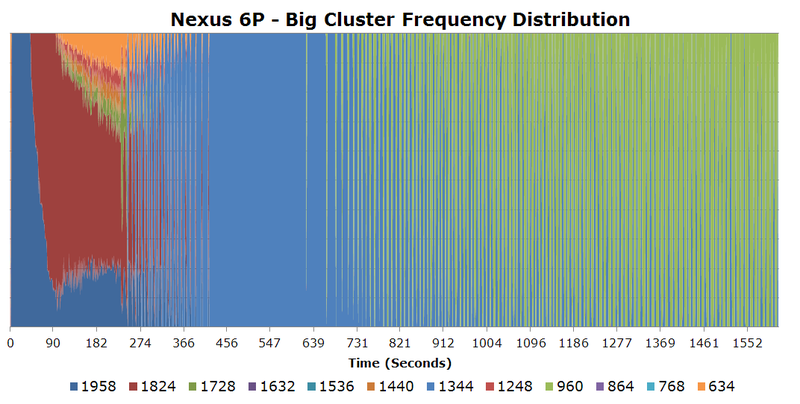 Looking at the frequency distribution graph for the Nexus 6P, we can see that the device is able to maintain its maximum frequency for about 45 seconds before it starts to quickly alternate with between the 1958MHz and 1824MHz states. As time progresses and device temperature rises, we see the higher frequency used less and less as the thermal driver continues to lower the allowed frequency/power cap. Qualcomm’s throttling mechanism seems to work on a fine-grained basis, resulting in us seeing usage of various frequencies within the time-window determined by the logging resolution (200ms), creating a pattern of exponential decay of a given frequency’s relative residency against other frequencies over the length of the thermal test. Again, the 6P seems to be able to hold up at fairly high frequencies of 1.9-1.8GHz until the lower frequencies gain in prominence. After the 5 minute mark (~300 seconds) it looks like the device stabilized at 1344MHz, but then again starts to oscillate with the 960MHz state around the 12 minute mark which becomes the predominant frequency for the last half of the 25+ minute test. One important factor that isn’t shown in this particular test is that the Nexus 6P shuts down its A57 cores under heavy GPU load, something that might affect gaming performance as real world games often have one high load CPU thread that isn’t reproduced by our synthetic 3D tests. Now, what is interesting is not only to look at how the 6P behaves, but how it compares to the behavior of other devices. In terms of maintaining highest frequencies for the longest, the HTC One M9 seems to be the best, but this comes with some quite high skin temperatures and the fact that after 10 minutes of the test the load is scheduled off the big cores and the little cores have to kick in, effectively more than halving the sustained performance. The LG G4 and G Flex2 both exhibit the most aggressive thermal policies as they are not able to exclusively sustain their top frequencies for more than a couple of seconds. At the highest frequencies the Nexus 5X seems to behave very similarly to the 6P but then suddenly drops down to the A53 little cluster at the 3 minute mark and tries to come back up to the A57 cores, but quickly falls back to the A53 cores in increasingly long periods until it just gives up and remains on the A53 cores for the last ~10 minutes that the test ran. The Mi Note Pro behaves uniquely that while it does maintain its highest frequencies over a minute, it abruptly limits itself to about half the frequency at the 1.5 minute mark and stays there. This seems to be a good middle-ground between providing good interaction and stable, sustainable performance. We published the OnePlus Two review earlier in the week, so people curious about that device are invited to read Brandon's review of the unit. OnePlus tries to improve the thermals by disabling the two upper frequency states, effectively limiting the SoC to 1766MHz. Unfortunately this doesn't make much of a difference to the phone's long-term performance as it still falls back to the 960MHz state after a while and at the end completely shuts off the A57 cores. This time around skin temperature is extremely hot, meaning the thermal policy is too lax and doesn't do a proper job of keeping reasonable device temperatures. Samsung’s throttling has a more random pattern as it looks to employ more defined hysteresises and changes frequency only over more prolonged periods of time. The S6 is able to maintain its top frequency for about 100 seconds before it falls back to 1.9, 1.8 and 1.7 GHz and alternates between the three states for a while before bottoming out at 1.5GHz towards the middle of the test. Interestingly it’s able to make a recovery towards the end as it still displays a lot of time spent at 1.8GHz, offering anywhere from double to triple the performance of the Snapdragon devices at comparable times in the throttling test. Ultimately, the question lies on how one would evaluate the various throttling behaviours. Mobile SoCs by design are not expected nor required to be able to sustain their maximum frequencies for prolonged times such as demonstrated by this throttling test. What does matter though is that user experience is not hindered by the frequency decay of the CPU. Here I think the Nexus 6P poses no issue as it’s currently the best performing Snapdragon 810 that we’ve tested and in everyday usage I wasn’t able to notice any severe limitations outside of gaming scenarios. 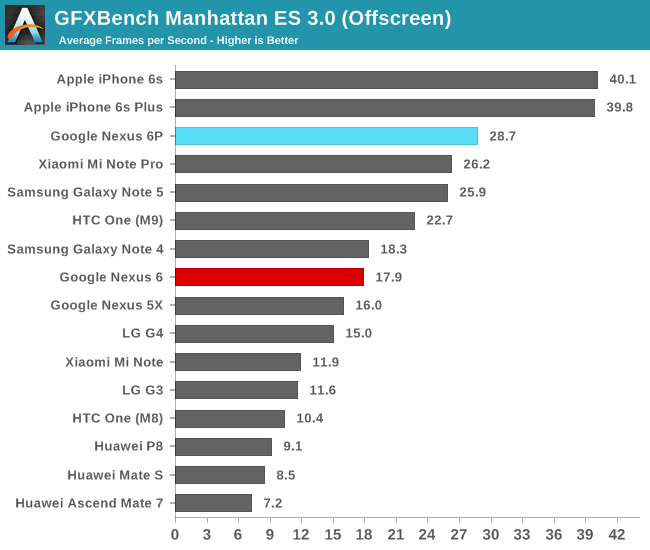 The LG G4 and G Flex 2 seem to be the worst offenders in terms of being able to sustain its top frequencies for usable amount of times, and the 5X seems to be the most volatile device of all as it will remain limited to its A53 cores for prolonged periods of time under raised temperatures. 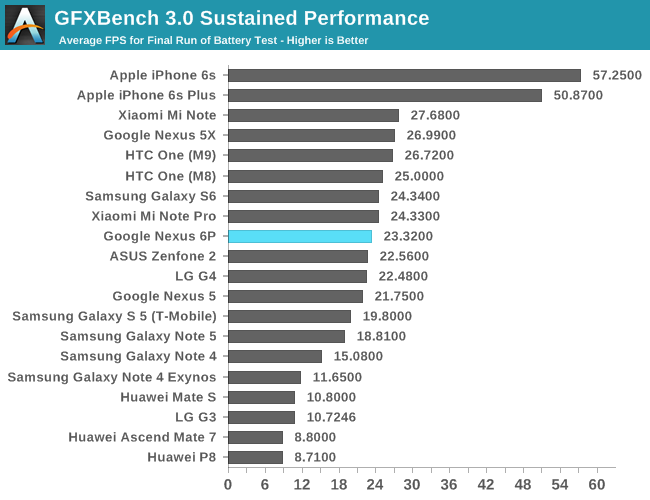 All in all, the Nexus 6P is probably the best Snapdragon 810 device we’ll get to see as it offers reasonable top-end performance while maintaining medium performance when it’s required to throttle down to preserve device skin temperatures, which by the way didn’t exceed ~39.5°C for the duration of the test (Thermal maximum measured at top center of the screen). Did anyone else find the stock Android complaints puzzling? I switched straight from a tiny iphone 5 to a Nexus 6 and no problems, I think stock Android is a revelation, bright, responsive and with Marshmallow very smooth. I don't use a brightness slider - seems kind of picky. And the back button is, well, fine. It's not like IOS's 'back' button in the upper left is more accessible, right? Finally, there should be gripes about out-of-the-box battery life. Ambient display, Google Now and Location services are too costly in battery to have on by default. Apple ruined music and Google search ruin Android. Irony. At least those can be turned off. Why I have to be prompted about location services when I ask for directions is beyond me - YES turn it back on, I asked for directions!